To the first post on the tablet – To the previous post on the tablet. In the last posts we looked at the overall layout of the Newberry Tablet and many symbols. The list has grown and we push to completion of this project by looking at twelve symbols in this post. The symbol identification thus far has suggested the topic of the tablet is a double comet collision and its crater as a point of reference for measurements. This suggests the remaining symbols should support and complete the story. Note the parallel line symbol in the first row and the cross hatching symbol that ends the fifth. Note the circle with two lines through it that ends the seventh. These suggest that the double comet arcs of Hudson Bay are to represent a reference point for longitude and latitude. Signs associated with this concept are studied here as well as another two groups of signs. The second and third groups require an understanding of the symbols as pictographs that would have meaning even today. The first symbol in the third row down uses an upstroke to elevate a cup symbol. Next to it is a symbol that can be described as a P on a line. Perhaps the upstroke means above or heavenly, and the horizontal line simply represents – on the surface of the Earth. With these ideas the study continues. We begin with the parallel lines in the first line and suggest it means to/from which is found in the glyph list at #221 except they used curved lines. Keep in mind that the two parallel lines may simply mean two or equal distance. They may also suggest lines of measure. The circle with the set of parallel lines continues the idea and perhaps means specifically either longitude and latitude or both and/or the measurement of such. Similar to this is the two lines with the horizontal mark found in the center of the fourth line from the bottom which suggests either two or perhaps measure and is so noted below. The cross hatching symbol suggests a grid or the longitude/latitude net of the Earth. Although not identical the symbol compared to the Luwian glyph meaning ‘above’ is similar to the symbol found at 3,1. Compare it to the symbols for ‘ma’ #110 and ‘thousand’ #400 and the second symbol from the table found at 2,1. (See diagram below.) The word ‘ma’ in Old English means ‘more.’ The position 3,1 suggests the value of Pi = 3.14 and is a number superior to all others as it relates the diameter to the circumference of a circle. The number 2,1 suggests two came from one which is an essential part of this historical story. Interestingly, Luwian glyph #91 is said to mean rotate/scale/foot. It is compared to the glyph found in the third row, third position and is shown below. It appears to be two shoes and a hook suggesting rotation. Note they are located at grid positions 3,3; 8,4; 10,6 and most notably 7,9. The 33 and 79 stand out immediately as the 33 degree latitude change of the pole and the diameter of the Earth at 7920 miles. The location of Hudson Bay is just west of the 79 degrees. But the other two numbers even in reverse are not of much importance. However! If one counts their position from the opposing corner (bottom right) then the two positions 7,7 and 5,6 are counted out. The latitude of Hudson Bay is 56 and the return period of Halley’s Comet is 76 to 77 years. This then correlates well with the proposed topic of the tablet and to the idea of scale, rotation and foot as found in the Luwian glyph #91. The staff is found in glyph #378. The associated symbol was used three times on the tablet and suggests a staff stuck in the ground. The symbol is found at 3,2; 11,3; and 12,6. The last when counted from the bottom is 3,5 or from the opposite side as 3,6. The first suggests 32 or the expression of 56.56 as its square. 113 is twice 56.5 and 12 and 6 suggest the base number system of measurement of longitude and latitude which is counted in units of 60 (seconds and minutes). The 3,6 position repeats this idea. The symbol next to the bottom P appears to be a slanted version so it may also be the same symbol but is not so noted here. Glyph #199 is said to mean ‘thunder’ and is very close to the symbol found at 4,3. Glyph #41 means ‘take’ and is close to the symbol in the table at 14,2 and mirrored at 14,8. Glyph #209 with sound ‘i’ appears to be the same as shown in the table and is taken to mean pole or eye. It is found notably at position 4,4. Counting from bottom right it is position 11, 7 and from bottom left it is at 11,4. The multiplication of these pairs gives 77 and 44. The 77 was just discussed and the 44 repeats the position 4,4. Recall that the circumference of the planet divided by 44 is 565 miles. This number was just discussed as the square root of 32. One should also recall the numerical spelling of the Hebrew god Yahweh is 5,6,5,10 or perhaps 56.5? Lastly, the symbol that looks like a backwards F is taken to be a sword or knife that stabs the ground and the idea repeats in the glyphs as seen in #278. The reader is left to explore its positions. 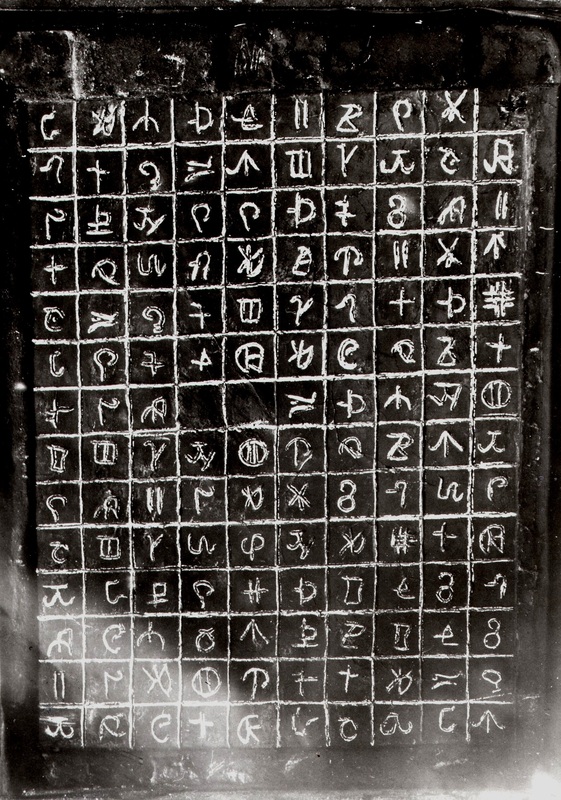 The associated words have been filled in and the tablet’s ideas are unfolding in this very complicated riddle and blending of ideas with Earth related numbers. The next post should complete the symbols that can be identified! This entry was posted in American History, Ancient History, Mysteries, Native American, Religion, Science and tagged Baal, Comet Impact, Luwian Hieroglyphs, Neolithic art interpretation, Newberry Tablet, Out of place artifact.